When cancer metastasizes, the tumor cells break their bonds with neighboring cells and the extracellular matrix (ECM) to enter the circulation. Cell surface molecules called integrins, which are involved in cell-cell and cell-ECM attachment, play an important role in metastasis. Much research has focused on β1 integrin alone, but since integrins exist normally as a complex of two distinct units (an α and a β), Mary Zutter and colleagues explored the role of α2β1 integrin – a collagen receptor – in cancer initiation and progression. They found that loss of α2β1 integrin markedly increased metastasis in a mouse model of breast cancer and in cell experiments. Their analysis of gene expression data from human breast and prostate cancers revealed that decreased expression of α2 integrin could predict metastatic potential and patient survival. 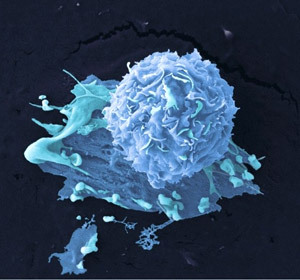 The results, reported in the Jan. 4 Journal of Clinical Investigation, suggest that α2β1 integrin acts as an important biological brake on tumor metastasis in breast – and possibly prostate – cancers.